Pramana Watu Kurung is part of a Balinese village on the outskirts of Ubud and as a result of this unique location, activities for in-house guests are influenced by local art and culture. 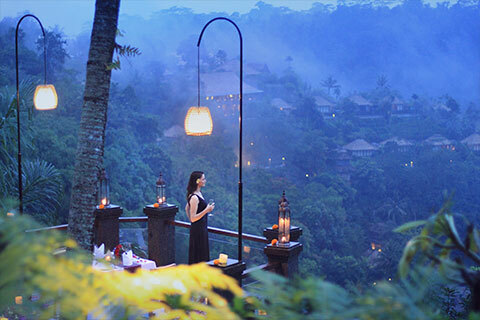 From classes teaching how to make temple offerings to mastering the graceful movements of traditional dance and learning to cook Balinese cuisine, there is something for just about everyone. Early morning trekking excursions through the neighbouring rice fields provide an opportunity to experience village life up close and personal. There are also fascinating temple tours as well as bike rides to explore the island’s tropical beauty. Every month, the resort conducts a village clean-up and guests are more than welcome to participate. For guests who are confident on bicycles and want more of an explore village experience in Bunutan Ubud. 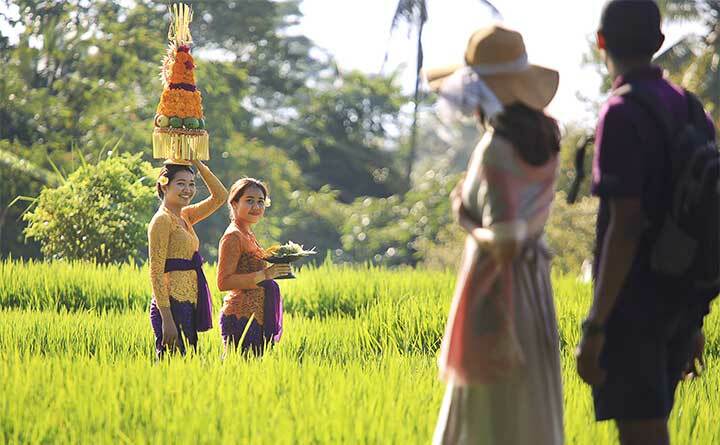 And also experiencing typical Balinese daily life and enjoying the beautiful Balinese countryside to Ubud. 2 hours complimentary based on availability, so one day advance reservation is appreciated. Experience your life with interacting to friendly local native speaker, observing their daily morning activities as well as learn about the culture and customs of Balinese people and village. Our guest activity will guide you on this walk. One day advance reservation is appreciated. Step out of your ordinary day and join us at the Surya Puja – Yoga Centre for an introduction into Balinese Dance. Our experienced instructor will gently guide you and your partner as you learn your first Balinese dance steps. Sample the integrated body movements, hand and facial gestures that make Balinese dance so unusual to new visitors. Our teacher will explain the meaning(s) behind the individual postures and gestures that comprise the basics of Balinese dance. It’s a wonderful way to expand one’s knowledge of the Bali-Hindu culture while enjoying a bit of exercise. We’ll provide the music, the sash and the sarong, so come join us for a few hours of fun! The details information about Balinese dance lesson is available 24 hours in our reception. Metanding is an activity to arrange a variety of offering material and make it becomes integrity of the Banten (offerings). While mejejahitan is part of metanding, which sew the Busung (coconut leaf) assembled with various flowers and leaves. Busung or coconut leaf usually cut according to the size which will be made, after sew with a semat (small sticks from bamboo and be a hook). 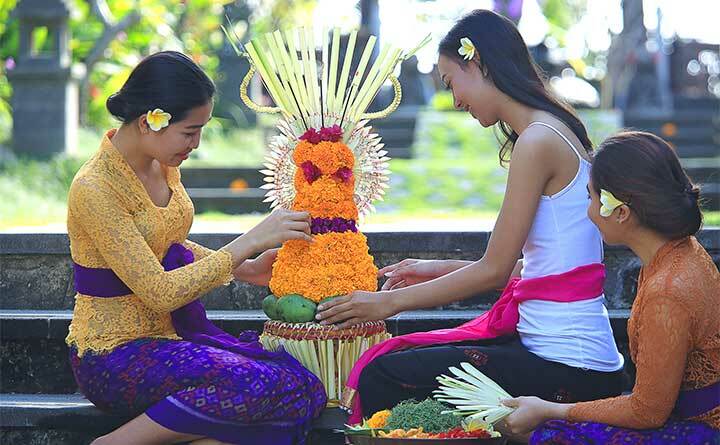 Mejejahitan usually conducted by women and men will be involved also in picking flowers, climbing coconut, looking leaf, or a variety of equipment on preparation stage. We invite you to join our guest activity hosted at Surya Puja – Yoga Centre every day to practice making Metanding and Mejajaitan. The details information is available at our reception 24 hours a day. Balinese Cooking Experience offers both morning and afternoon classes, The English-speaking class is held in our local Professional Chef, it will be a very unique and memorable hands-on experience. Learn how to make traditional Balinese food and traditional coconut oil. No prior experience is required and everyone is welcome!, .hence reservations way in advance are highly recommended. Rates start from IDR 650.000++ per person. 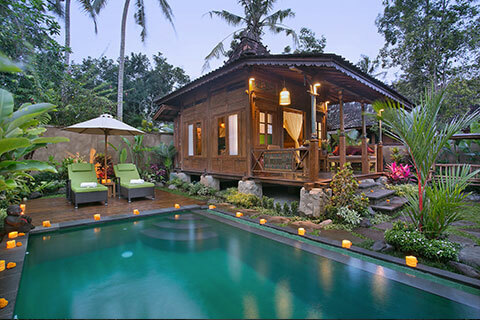 The Pramana Spa at Pramana Watukurung is designed to give a personalized in Resort service. The Pramana Spa is set incorporate with the lobby lounge on the second floor with one treatment with rice field view, bridge, featuring 2 room with twin massage beds, shower and bath. Embracing the sight and sounds while enjoying signature treatments using local herbs ingredients from a relaxation massage to intensive detox program. There is a spacious studio on upper level facing to the rice field and unique bridge. Throughout the ancient art of classical yoga, you will learn the technique to still your mind, strengthen your body and expand your consciousness using posture, breath work, meditation and relaxation while hearing the natural sounds below. The class is suitable for beginner. It is available by request outside of regular complimentary class schedule. Our yoga Instructor will offer you to a deeper technique Of Yoga. Surya Puja – Yoga centre will be a perfect spot to do but how ever this private lesson can also be done in your villa. Price at IDR 350.000 subject to 21 % service and tax per person. 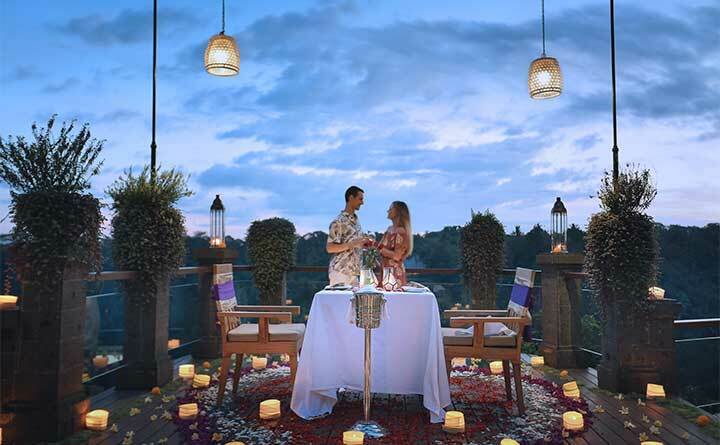 Share a unforgettable evening with your beloved with this amorous dinner under the stars. Enjoy the cool evening air and nature's symphony of chirping crickets while tucking into our signature dishes overlooking the impressive valley before you. So If you're looking to surprise your special someone with a romantic dinner, this meal under the stars is sure to delight. No matter the occasion, we help you create the perfect setting for a night to remember. Reservation is required one day in advance. 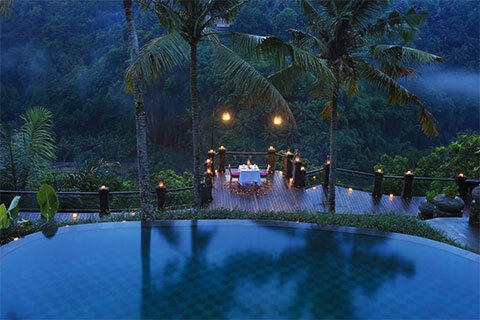 Price is USD 150 for 2 pax, including a bottle of house wine, subject to 21% government tax and service charge. 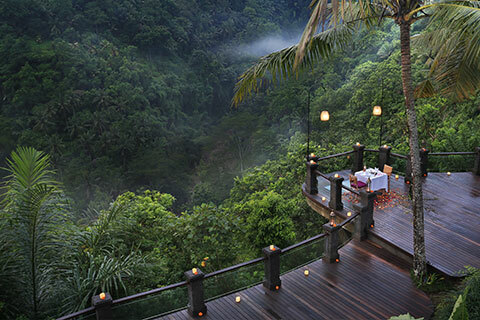 Bali is a small island, but it has everything tourists need, from traditional indigenous to modern activities. Bali is a paradise for visitor, as it has been nicknamed as the Paradise Island, the Majesty Island, the morning of the world, the island with thousands of temple and others. The resort is committed to support the local community, transportation organization, who will assist you to learn and explore more its places of interest, various typical local cultures, enjoy the hospitality of the people. Our Guest Relation officer will be pleased to assist you with a suggestion of tour itinerary as you would like to visit. Recommended Itinerary. Inclusion : Petrol, Parking fees, Balinese cloth for temple visit, English speaking driver, Cold mineral water. Temple’s admission fees are NOT included. Price IDR 1,040K net/car with English speaking driver. 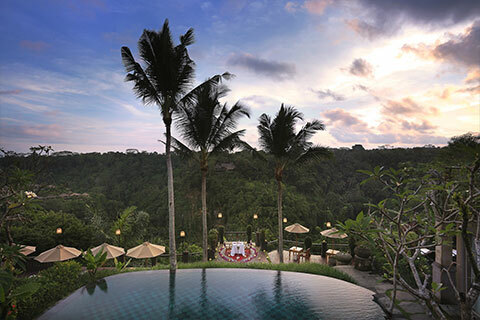 Pramana Watu Kurung is located just 15 minutes from central Ubud and it belongs to a small village that sits above the Ayung River. The resort is surrounded by productive rice fields and dense tropical terrain. It is a charming area where guests can detach from the stresses of daily life and embrace the simple pleasures of nature. ©2019 Pramana Watukurung. All right reserved.